1. What is Anuraag Foundation? Anuraag Foundation is a US Based, tax exempt charity with a mission to support schools for mentally challenged children of poor families in India. 2. Our Projects in India. 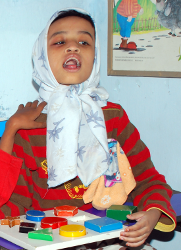 Currently we are supporting ”Anuraag School for mentally Challenged” in Secunderabad, India. There are 100 students now in the school who are mainly drawn from slum areas around. 3. What services/programs are offered in the school? Following programs are offered to the students in the school. Objective of these programs is to make these less fortunate individuals self-reliant get back to main stream society and become productive. Educational assessment and guidance for slow learners with specific learning disabilities. 4. What kinds of mental disabilities we address? 5. How the behavioral modification is brought in the mentally challenged children? Instruction is given in 5 methods. Focus is on encouraging learning life skills and boosting their morale level. Functional: Reading, Writing, Math and other functional education needed to survive in the life. Occupational: Depending on their Social and Financial affordability, give them occupational training to generate some income. Recreational: To create enthusiasm and to relax their minds, offer programs that include playing, singing, drawing, painting etc. The emphasis will be on encouraging and stimulating individual creativity. 6. What is typical expenditure of the school? Currently, school has 100 students drawn from slum areas around and incurs monthly expenditure of Rs 3,00,000 (around $5000 per month, $60,000 per year). It approximately comes around $730 per student per year.